Each skin has pores, especially the pores on the face more sensitive because it is more easily infected. 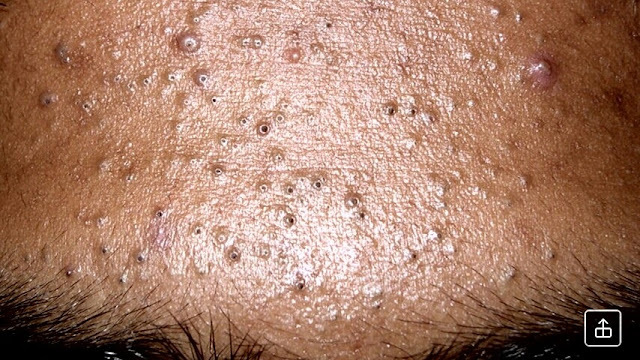 Pores on the face can also be clogged by oil, dead skin cells, and dirt that every day you get when doing activities outside the home.Clogged facial pores can not be left alone, because if you ignore and lazy to clean clogged face pores then this can cause the appearance of blackheads and acne on your facial skin. As we know that blackheads and acne is one of the scourges most feared by teenagers because of acne and blackheads that appear on the skin can make less confident and embarrassed to get out of the house. The cause of clogged facial pores is very diverse, ranging from caused by dirt such as dust, the presence of dead skin cells and oil. If you are having clogged pore problem some of the methods below can be tested. The first and the easiest way is to use water vapor. Heat from water vapor will make the skin pores open, so the dirt will be easier to clean.the way that you prepare enough water, you cook until boiling, then you input into a large container, close your face on the bowl, let stand until the pores open and clean the dirt on your pores with water. Honey is a sweet liquid produced from honeycomb, this fluid has many benefits for health and beauty. In the world of beauty, honey has been used since thousands of years ago. Honey can overcome various skin problems such as acne, blackheads and so forth.doing treatment using honey will make the skin becomes supple and youthful, honey will also clean the clogged pores of the skin. The trick is very easy, ie you apply honey on the facial skin that has been cleaned first, let stand for 15 minutes and rinse with water until clean. Exfoliation is the removal of dead skin cells on the face surface. This is useful to help keep the skin clean, so the face does not look dull due to the buildup of dead skin cells. This process is usually done with treatments such as facials, microdermabrasion or chemical peels.actually how to exfoliate this facial skin can be done in several ways but one of the easiest way of facial exfoliation is to use natural homemade face scrubs.many natural home ingredients that we can make as a facial scrub for example made from sugar. How to make a face scrub from sugar is very easy, first you must prepare sugar, honey and green tea. Brew tea with hot water, then take about 2 teaspoons and input into the bowl.when the tea is still warm input sugar and honey as much as a spoon into the bowl and stir to mix well. Apply to the scrub face that we have made, rub gently on the entire surface of the face evenly so that dead skin that sticks on your face can be lost and peeled off.after 15 minutes Then rinse your face using cold, clean water and dry using a clean towel. Dirt that clogs the pores will usually cause the appearance of blackheads on the face. Well, to clean it then you can also use products or tool comedones blackheads.now there are so many products such as instant face mask to remove and remove blackheads and clean up the dirt that clog the pores of your face are sold in the market or cosmetics stores.for those of you who want to be practical and do not want to bother doing the above ways then can choose an instant way that is by buying a comedy products comedy. The point is if you do not want your pores pores face clogged so rajinlah wash the face so that any dirt dirt on the face does not stick and settle in the face. 0 Response to "How to clean clogged pores, try some of these methods"